We begin life very self-centered; as infants we are totally dependent, so we are only interested in having our personal needs met. Only later do we recognize other individuals and begin to consider their needs. However, our process of socialization is not smooth. Along the way are disappointments, conflicts, and misunderstandings; we are hurt by people in various ways so that we develop fears, defense mechanisms, and emotional scars. We exhibit unpleasant personality features that push other people away. To a lesser or greater extent, we find ourselves lonely and alienated. We also come to realize that through our attitudes and behavior we hurt other people as well—whether we intend to or not, and knowing this usually causes feelings of guilt and self-condemnation. Even if we hurt people on purpose we know it is wrong because we don’t want people to do such things to us. Pain. Fear. Alienation. 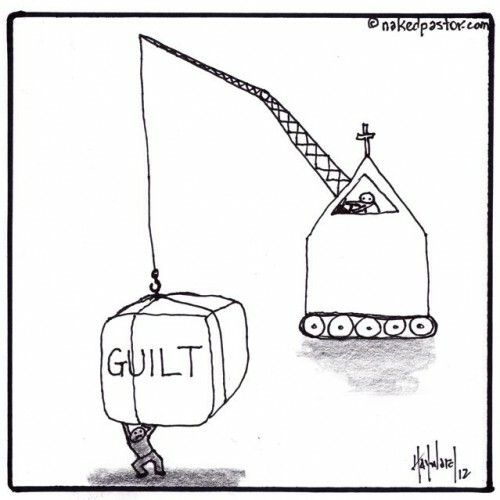 Guilt. These are the feelings we carry. Does this seem to describe you? Perhaps this is not your experience, but most of us can identify. Our ability to relate well to other people is often hampered by our continued self-centeredness along with our pain of being misunderstood, mistreated, and otherwise wounded—sometimes viciously. Some church people make the situation worse. We are told that God is angry and disappointed with us and that he cannot bear to look at our sinfulness. We are worthless worms or like filthy rags. We are told further that there is nothing we can do to remedy the situation. Even after we begin to follow Jesus, we are constantly told that we don’t measure up and that if we fail to live according to the standards we are in danger of losing everything and being punished in hell fire for eternity to satisfy God’s justice. We hear frequently how bad and worthless we are in the eyes of God. All this judgment, condemnation, and shaming have an effect on us. After being demeaned, disdained, and demoralized by the people of the church and becoming convinced that neither they nor God really loves us for who we are, we sometimes find that we don’t love ourselves very much. Thinking that God is unhappy and disappointed with us affects our self-image and leads to our unhappiness and self-destructive behavior. If we have too often heard the message that we are not lovable and that even God is angry and disappointed in us, there is another who tells us a different story. Jesus shares with us that the Father is not angry and harsh with us (click to read), but loves us unconditionally. This is Good News! When we are twisted with emotional scars, low self-esteem, and self-destruction, it is Very Good News to learn the Father loves us so much; it frees us from fear, guilt, and self-condemnation. When other people do not find us lovable and we don’t even love ourselves adequately, we learn that the Father—the one who knows us best of all—disagrees. He loves us; and when we realize this we can begin to love ourselves more appropriately. Yes! We are imperfect. Yes! We need help to become better. But the Father accepts us just the way we are. Rather than despising and berating us for our shortcomings—no matter how severe they might be—the Father understands us, and he understands why we are as we are. The Father perceives us far more clearly and accurately than the best trained counseling psychologist. He knows us better than we know ourselves. He knows our defensiveness, our personality traits, our motivations, and our true desires to be better than we find ourselves to be. And he wants to heal our alienation and our feelings of aloneness. We are told that we should love others as we love ourselves, but if we do not love ourselves then we cannot truly and fully love other people. We might feel helpless, hopeless, and beaten down, but we become able to love ourselves when we see ourselves the way the Father sees us. And how does the Father see us? He sees us as individually valuable and lovable. He does not cast his eyes away from us in disgust but embraces us in love and kindness. He desires our happiness and reconciliation with him, ourselves, and other people. He wants the very best for each of us. This is how the Father loves us; and when we see ourselves as he sees us we can begin to love ourselves. And once that happens, we can see other people the way the Father sees them and begin to love them as we now love ourselves. This is another process of reconciliation. Then Why Do I still Feel Guilty? Even after hearing this Good News, perhaps you still feel fearful and/or guilty. 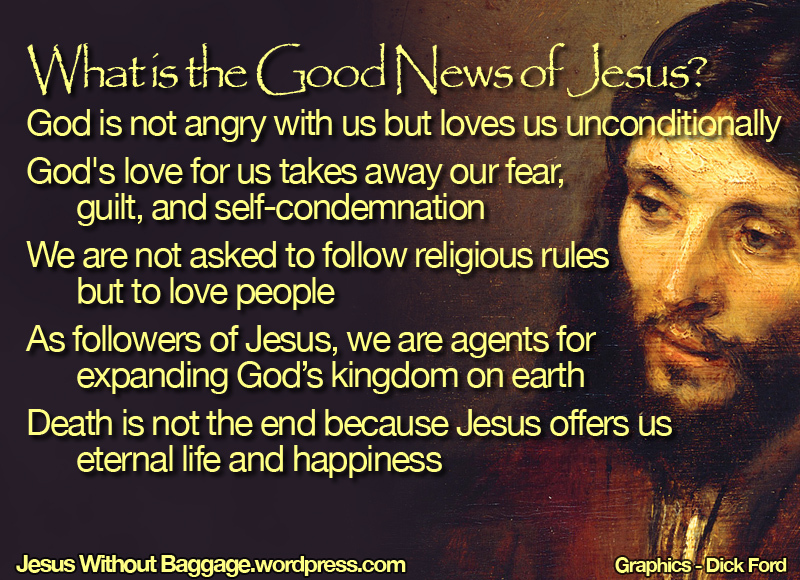 This is understandable because this post is only an announcement of the Good News; it is not an explanation. We will discuss that next time. This entry was posted in alienation, fear, God, Jesus, love, sin, The Father, the Good News and tagged Naked Pastor. Bookmark the permalink. Jesus tells us we are more valuable than the birds and the grass (Matthew 6:26,30) and many sparrows (Luke 12:7). By which he means that God values us highly. And we should value ourselves not put ourselves down. It is also true that we cannot love others if we don’t love yourself. Words have the power to both destroy and heal. When words are both true and kind, they can change our world. So, why not we bestow only kind and healing words and emerge from the quagmire of pain and alienation? Doing this, you will stop burdening yourself with guilt and fear and apparently, you will come out completely unscathed! Well said, Tom! Often we don’t seem to care about the effects of our words on others; it is all about us. I like your suggestion to use our words for healing and making a positive difference in pain and alienation. Thank you for sharing this with us. I’m really enjoying your blog and find myself agreeing almost completely. I do have one problem, and you’re in good company: you share it with Jesus. Jesus, and you, refer to God as the Father. My own experiences of The Divine have been genderless, so I wonder if using the language of Fatherhood is perhaps too limiting. I’m sure it’s a product of the culture, both of 2000 years ago, when one *really* needed a father to survive and thrive, and now. Is God male? Is God only male?Could you maybe address this issue? Johanna, I am glad you enjoy the blog. And you raise a very good question: Is God male? Since nobody knows this kind of detail about God, I can only give you my thoughts–No, I do not think God is male. And Yes, I think that imagining God as male is very limiting. I often try to overcome this by using him/her or his/her, and sometimes I try to avoid using pronouns at all by just using the word ‘God’, but this is not always possible. The complication, as you point out, is that Jesus talks of God as the ‘Father’, which was a vast improvement over the way God was envisioned before. On occasion I use the term Father/Mother but this would be inaccurate when quoting Jesus or alluding to his words because he never used Father/Mother. Now elsewhere in the Bible God is described in female terms, so God is not universally depicted as male even in the Bible. And even Jesus said he would like to gather people like a hen gathers chicks thus demonstrating a maternal trait. I do not imagine God in gender terms, but I do use the term ‘Father’ because Jesus did so. This is imperfect and can be misleading, but this imprecision is often the case in language. Do you have a solution I have not considered?